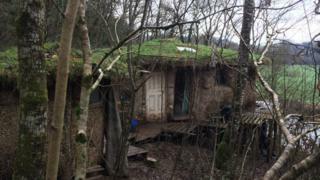 A couple who live in a mud hut and claim they have "an allergy to modern life" have vowed to defy a council eviction order. Kate and Alan Burrows built their home in north Devon from tree trunks, mud and straw without planning permission. North Devon Council has issued an enforcement notice for them to remove their home by Saturday. The couple want their case debated by the council and have rejected its offer of accommodation in a Travelodge. Mr and Mrs Burrows, who have lived on their smallholding in the Tarka Valley, near Chulmleigh, Devon, since 2015, said they would rather the offer was made to homeless people. And Mrs Burrows said living in the Travelodge in Barnstaple would leave her "bedridden". "I cannot live in that way," she said. "I have been in one before and I could not sleep, I would be so ill in 24 hours." The couple have appealed against the enforcement order, citing illness from a condition called Multiple Chemical Sensitivity (MCS), but this was rejected. Mrs Burrows said the pair had thriving businesses selling willow, baskets and other goods, as well as supplying young saplings for river bank reinforcement. They also have a number of animals including geese and goats said Mrs Burrows. "What am I going to do, bring it with me to the Travelodge?" she said. Barrowman panto "too smutty for kids"
Planning officer Mike Kelly said the authority was "supportive of sustainable development" but it "does not mean allowing people to develop wherever they wish". He said that the full council would not be debating their case because it was against the council's constitution. The council would visit the site and "a decision will be made about what future action may be appropriate". Multiple Chemical Sensitivity, also known as idiopathic environmental intolerance, is said to cause sufferers to react to low levels of certain chemicals found in everyday products. It is a contentious topic among some medical professionals, and there is disagreement over whether it is a genuine condition. Image caption Mrs Burrows said that living in a Travelodge would make her "bedridden"